October 01, 2001 : Amb-Trans is now capable of transporting Patients with Ventilators. Amb-Trans provides Ventilators during the transports if needed or we can utilize the Patients existing Ventilators. The choice is yours. October 12, 2001 : Amb-Trans Employees are now Identified by Picture ID Badges consisting of the Employee's Name, Picture, Company Position, Certification Level. All ID Badges will bear the United States Great Seal followed by the State of Texas Seal, The Texas Department of Health Logo, The Star of Life, and finally the Amb-Trans Logo. October 25, 2001 : Amb-Trans sets up In-House Training for all its employees with our Medical Director (Dr. Robert Williamson) allowing Amb-Trans Employees to be trained in Specialized Services above and beyond normal Medic Training. 2005 : Amb-Trans increases all Employee Pay to be the highest paid Medics in the private industry. 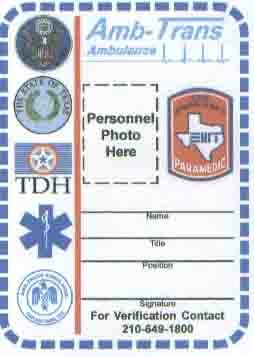 2006 : Amb-Trans initiates the "San Antonio Private EMS Organization"